I am sure like me you are wondering what Terra Cotta Warriors are. Actually, before now, the only 'Terra Cotta' I knew is the one used to roof American homes. Luckily for you, I have done a little research about them and you will not have as hard a time figuring what they are. For one, Terra Cotta Warriors are a collection of terracotta sculptures depicting the armies of Qin Shi Huang, the first Emperor of China. They are a form of funeral art that was used to bury people of influence in ancient China. The first Emperor of China (210–209 BC) was buried with them to protect him in the afterlife. Below are some interesting facts about the sculptures. 1. There are about 8,000 life size statues of soldiers buried along with the king. 2. Have you ever heard of "elixir of life"? Well, it is the immortality bug that seems to bite every great person. It started with emperor Qin of China who spent considerable resources trying to look for it. The Terra Cotta Warriors were part of this quest. 3. Most of the statues measure 5 feet 11 inches tall but some soldiers are as tall as 6 foot 7 inches. 4. 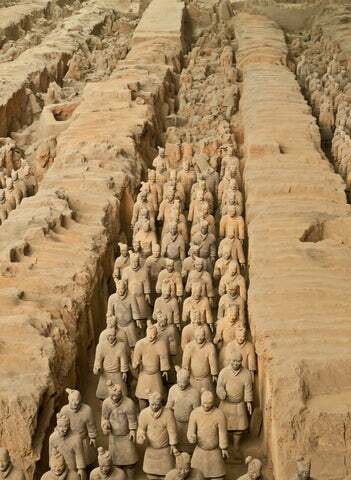 The Statues were made to represent all battalions in ancient Chinese Army. Some are plainclothes (spies); others are dressed like the cavalry while others are dressed like foot soldiers. 5. The Statues were made by over 700,000 thousand workers who were involved in molding legs, arms, torsos, and heads etc. which were then assembled together. 6. Apart from the soldiers, the king was also buried with 150 life-size cavalry horses and 130 chariots with 520 horses buried with the army. 8. The bronze weapons that they soldiers were buried with features some chromium coating that ensured they stayed protected from thousands of years below the ground. 9. The Terra Cotta is one of the oldest and most significant imperial burial grounds to be discovered in modern times. 10. The archaeological site where the imperial burial site was discovered was labeled a UNESCO world heritage site in 1987. I hope now you know a thing or two about the Terra Cotta Warriors. There are hundreds of interesting facts about the warriors...I have run out of space though. You will have to do the rest of research by yourself.